East Village cocktail bar Mace is once again undergoing its Christmasified transformation to become a tinsel and faux snow-covered wonderland of everything that is great about holiday drinking, appropriately known as Miracle on Ninth Street. 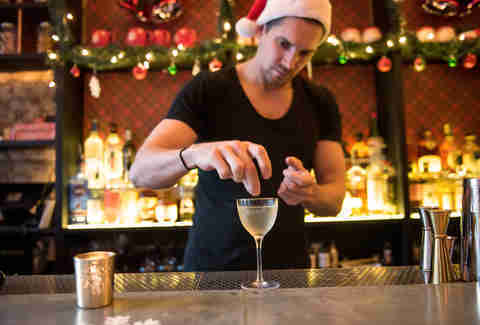 Sip on cocktails like the Christmapolitan (vodka, elderflower liqueur, spiced cranberry sauce) or the Muletide (Linie aquavit, Oloroso sherry, ginger syrup, lime juice, pumpkin pie soda). Or go all in with “naughty and nice” shots as you drink up enough confidence to shout along to “All I Want for Christmas Is You” when it inevitably strikes up again throughout the bar’s speaker system. No one said these gifts couldn’t be for you. While tourists flock to holiday markets throughout the city, this annual Downtown shopping tradition is manageable by visiting at sunset or later, if you can take the chill. 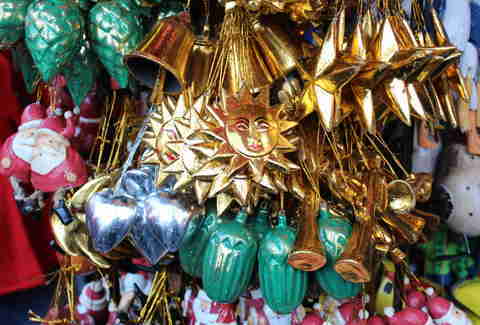 Browse booths showing off unique clothing, ornaments, candles, and more by local artisans. Then treat yourself to a fancy cup of hot chocolate and take a few seasonal photos in the holidays lights before you warm up at a restaurant nearby. It’s the only free ice rink in New York City — if you bring your own skates, of course (renting a pair costs $20). 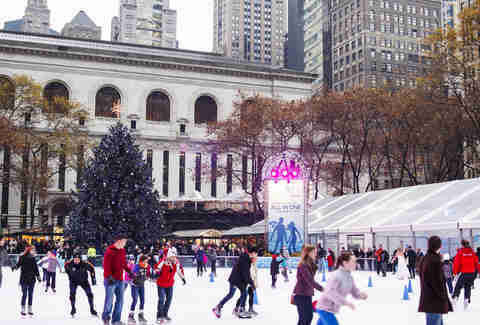 There’s pretty much nothing more seasonal than gliding and/or tottering across the ice as holiday music is streamed across the rink and the lights of the Midtown skyline illuminate your icy breath. Fit in a pre-work skate when the rink opens at 8am to beat the crowds and enjoy some personal space on the ice. So that Groupon for the tropical winter getaway of your dreams didn’t work out, but you can still bum it on the beach at this Tiki paradise popping up at Boilermaker. Sip Polynesian cocktails out of coconuts, or go for the truly seasonal Chinatown Christmas cocktail, made with Chinese five spice-infused Scotch, plum wine, Demerara, and angostura bitters (all served on a snowball). 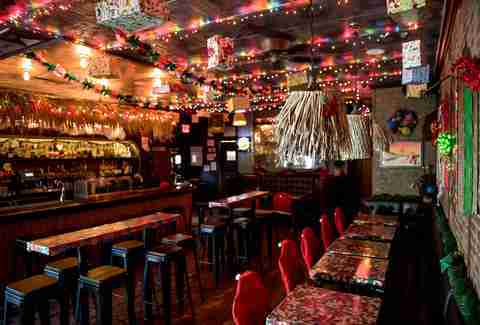 When in doubt, go with the latter, because no matter how much palm tree decor is packed in this place, it’s winter, dammit, and you should drink like it’s a snow day. 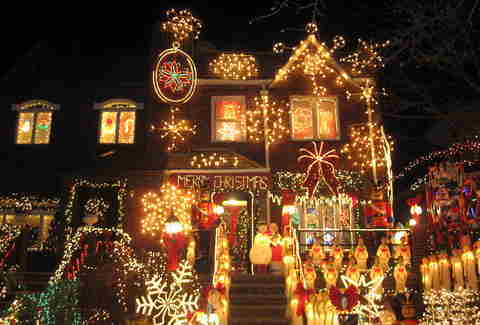 While you were busy looking for an extra outlet in your apartment with enough surrounding space to actually be able to plug in the lights on your tree, the residents of Dyker Heights were turning their Brooklyn abodes into Griswold-level illuminations — an annual tradition that puts this neighborhood on the New York hotspot map every year. Bundle up and walk down 82nd St (or get an Uber) to see the full scope of the magical displays. Even if you’re not big on holiday traditions, there’s just something about December that brings out the nostalgia for the New York of decades past — or Old New York, if you will. Travel back to a simpler time in the MTA’s vintage fleet of subway cars and buses, rolling out on winter weekends and payable by MetroCard, because we’re not willing to actually forgo modern technology entirely. Window shopping for obscenely expensive couture outfits is totally acceptable this time of year. 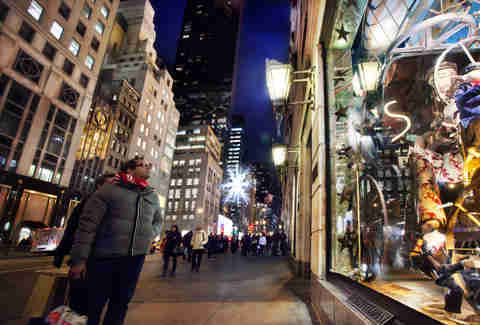 High-end retailers like Bergdorf Goodman and the more affordable Lord & Taylor go all out to lure in customers with glittering, musical, moving window displays that truly embrace the capitalist Christmas spirit — in the best way possible, of course. If being surrounded by shopping bags screams holiday time to you, linger past the windows along Fifth Ave near 57th St and walk all the way down to Macy’s to catch the annually changing displays. Hey, it’s free to look! 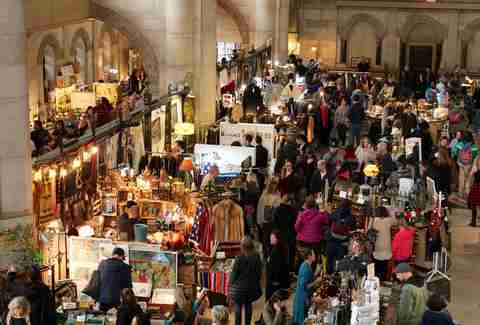 The outdoor holiday markets are festive and all, but why not head to an indoor shopping experience where you can pick out some gifts without the fog of your breath and looming threat of sleet distracting from your shopping goals. About 100 vendors set up at the Winter Flea, selling everything from vintage records and typewriters to homemade jewelry, knitwear, and more, making it an easy spot for all of your holiday shopping. Plus, there’s a bar serving warm mulled wine and an assortment of Smorgasburg vendors selling tacos and other foods. The market is open extra hours during the week before Christmas, making it a great last-minute stop to pick up all those second cousins’ presents you forgot you needed. 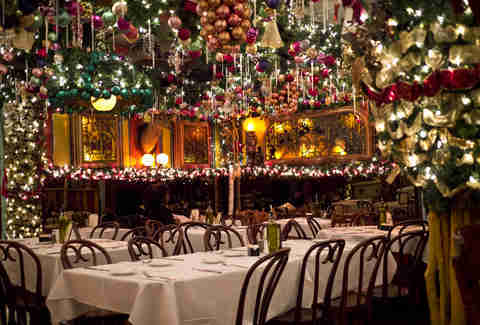 No holiday season in New York is complete without a trip to Rolf’s. The German restaurant gets traditionally decked out in ornaments, tinsel, and Christmas lights like no place else in town, making it nearly impossible to pass up on a cold December night (and beyond). 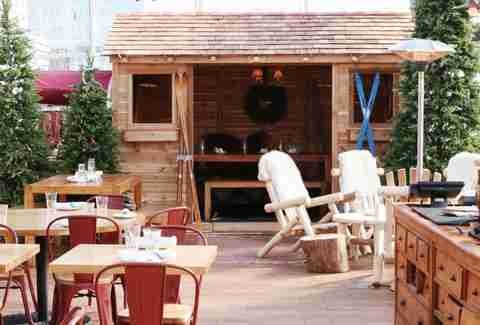 Crowd into the bar to sip an eggnog cocktail, or reserve a table to fill up on deep fried jaeger schnitzel and spätzle. If the extreme holiday decor didn’t tip you off already, carb season is in full force. Even if you gave up model trains as soon as you were old enough to buy your own MetroCard, you won’t want to miss this seriously impressive holiday tradition at the New York Botanical Garden. 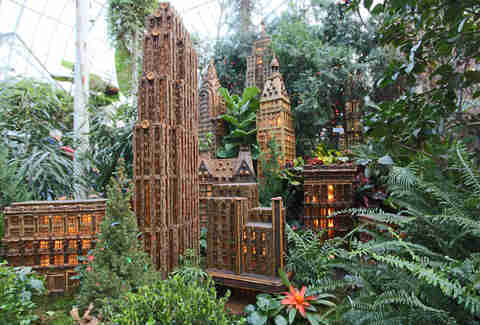 The conservatory is transformed into a fairy wonderland where the New York Public Library is made of moss and twigs and the Empire State Building hovers over a Manhattan created from all natural materials, as model trains zip by on all sides of you and overhead. Child-wary attendees take note: To see this entrancing spectacle in the company of adults, visit for Bar Car Nights, when spiked hot beverages make this holiday tradition even more magical. Sure, it’s touristy, but everyone has to stop for a selfie by the tree at Rockefeller Center and then push their way across the street to Radio City at least once! And preferably on a weekday, when crowds are slightly less awful. 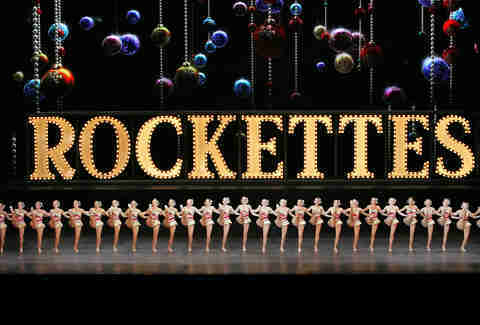 The holiday spirit is contagious with every kick in the “Christmas Spectacular,” and you can revel in the cheesiness of it all for months to come — all while wearing your souvenir T-shirt, of course. 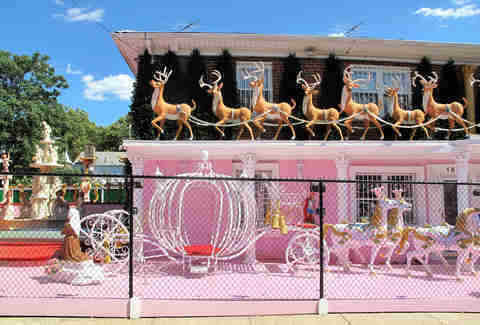 Bronx natives know the Garabedian family’s residence at 1605 Pelham Parkway to be the outlandish epitome of the holiday season in all its glowing, illuminated glory. Grab a to-go hot chocolate and prepare to watch the cheesy splendor of hundreds of figurines dancing to holiday music in a light display that is completely unprecedented in New York City. Your fire escape Christmas lights should be ashamed. 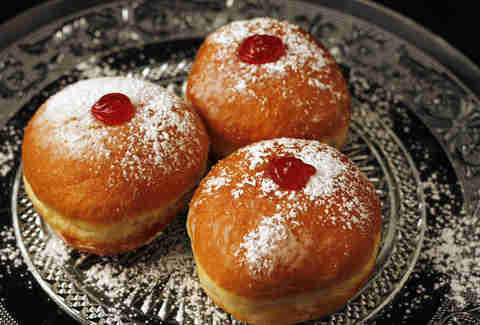 Sufganiyot, the fried and stuffed jelly donuts made specially for Hanukkah, are back at Breads bakery on December 19th. This year’s flavors include dulce de leche, strawberry, and vanilla mascarpone, and you may want to save room for a few piece of rugelach — you know, as long as you walked into the bakery and everything. For the second year, Manhattan’s massive Italian food market, Eataly, is operating a rustic Alps-themed pop-up restaurant called Baita (that’s Piedmontese for “ski lodge”) on the Flatiron-area building’s 14th floor. To get there, just ride the elevator (and maybe make an OpenTable reservation, if you’re organized). The covered rooftop bar offers extra warmth with the help of mulled wine, a polenta bar, and melting raclette dripped to order over your choice of meat or vegetables. If you can gather up nine friends, plan a family-style beef shank party to help put on that winter weight in Baita’s private rooftop cabin, illuminated by the lights of the Christmas tree reflecting off the fake snow.